"No wonder why there aren’t many young women in politics." A Bloc Quebecois candidate says a sexist insult she faced on the first day of her campaign might help explain why some women stay out of politics. But it wasn’t just the slur that bothered Catherine Fournier, a 23-year-old who is running in the riding of Montarville. It was the fact that a Global TV News anchor in Montreal evidently found it hilarious. Fournier was one of several candidates to appear next to Bloc Leader Gilles Duceppe Sunday at a press conference shortly after the election call. She was featured prominently on camera throughout Duceppe’s remarks. In no time, someone took to Twitter with a screengrab and some crude commentary. "Look at the womans face in this pic ! she is ready to drop thong for this guy ! POWER = aphrodisiac," wrote whoever goes by the handle brrreaking_news. The tweets associated with that account have since been protected. 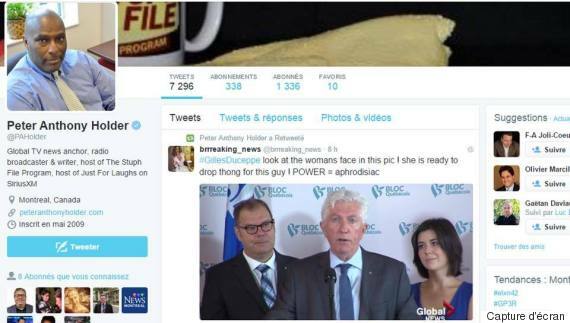 Peter Anthony Holder, a longtime journalist in Montreal, retweeted the insult. And, in tweets that have since been deleted, Holder added he was "thinking the same thing" when he watched the presser and "God did your tweet make me laugh out loud." Fournier took to Facebook to say the "joke" was proof of the double standard that female politicians face. "This kind of joke, endorsed by Peter Anthony Holder from Global News, would have NEVER happened had I been a man," she wrote in French. Fournier asked if Global News tolerates such "explicit sexism." "This is degrading," she wrote. "No wonder why there aren’t many young women in politics." The Canadian Press reports that Holder has since apologized, conceding his post was "inappropriate."